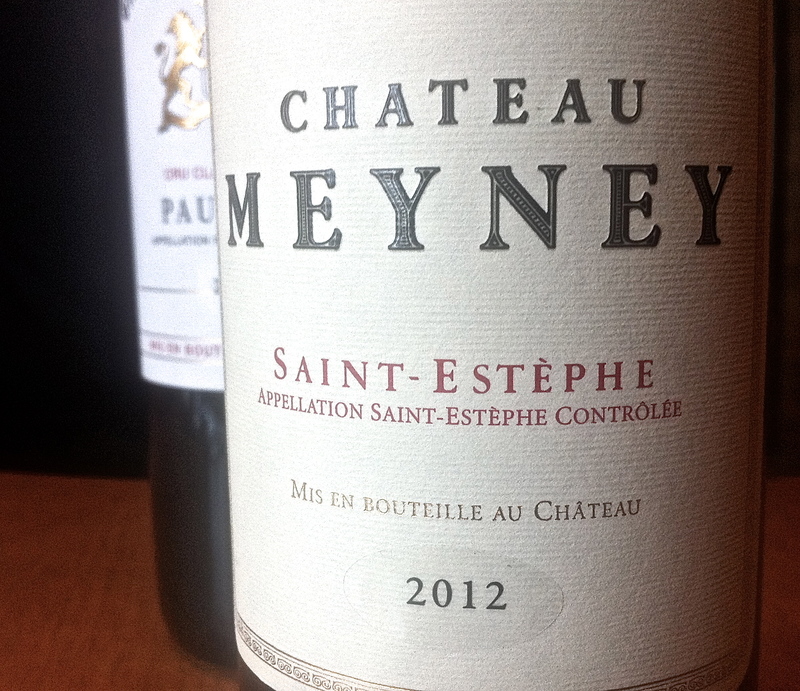 Despite the vagaries of the vintage it would be a mistake to overlook St Estèphe in 2012. At the top end excellent wines have been made at Chateau Calon-Ségur, Chateau Cos d’Estournel and Chateau Montrose especially. Further down the chain there are values to be had if you pick carefully. I’ve written about the excellent effort at Chateau Meyney, but very fine wine has been made at Chateau Phélan-Ségur and there is a surprisingly good Chateau de Pez. The vintage can’t be compared to 2009 and 2010 but it’s probably better than the 2011 vintage here at least. Where the price is right, and in a few cases it is, you could consider some of these wines en primeur. The 2012 vintage is not homogeneous in St Estèphe. Certain properties succeeded, others haven’t. The essential elements were well-drained but sufficiently water retentive soils, diligent vineyard work and an extremely steady nerve at harvest. Fortune favoured the brave. If your fruit was healthy and you had the resources to pick large areas in a speedy fashion then your best bet was to pick as late as you possibly could, despite the dark clouds and wet weather that accompanied the very end of the harvest. This is how Chateau Montrose triumphed. Great terroir and due diligence also lies behind the fine, classical effort at Calon-Ségur. 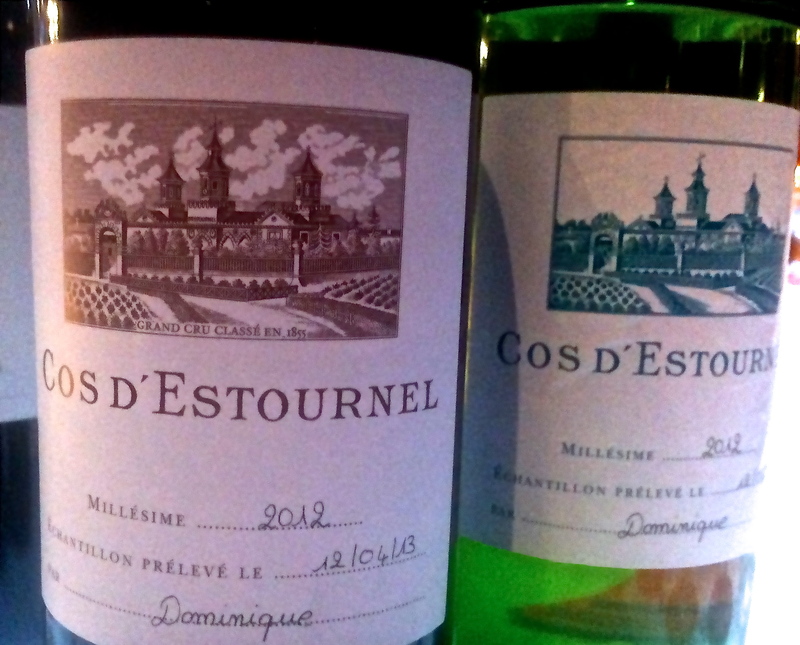 Lavish attention and ambition has also allowed Cos d’Estournel to deliver power and panache from its own enviable terroir. The other thing to remember is that Merlot did succeed in 2012, being riper sooner than the Cabernet Sauvignon, it was not hit by the bad weather [or the threat of it]. Many blends in St Estèphe favour Merlot, if not in the majority, often up to 30-40% of the blends. The variety is fuller, more gutsy and tannic here than the more delicate, perfumed Merlot on display in the Margaux commune in 2012. Nor does it have the sheer beauty of Pomerol’s Merlot, but it has helped fill these wines out and, accordingly, quite a few properties have upped the Merlot used in the blend this year. There was a little variability in the Union des Grand Crus tastings, some chateaux showed well one day and not so well a few days later. I think we can probably say that these will settle overtime. Chateau Ormes de Pez and Chateau Cos Labory were both in this category, with samples being alternately impressive, then a bit angular and sullen. I’m now wondering if it was atmospheric pressure [I’m not entirely joking] but either way I’d expect these wines to settle in the long run, Ormes de Pez especially. A few properties hadn’t done as well as you might expect. Chateau Haut-Marbuzet, was much less exuberant than usual and Chateau Lafon-Rochet, though pure enough, felt a little lean. I’m sure Lafon-Rochet will fill out but there is not really much sense in splashing out on either of these when so much of their excellent 2009s and 2010s can still be spotted about. These wines really are worth the extra premium. Lafon-Rochet’s 2009 is a wine of remarkable concentration and depth. So what to do if you’re a St Estèphe fan and on a budget [like me]? Do consider Chateau Meyney [see earlier blog post]. It’s a treat in 2012. I was also impressed with Chateau de Pez on the two occasions I tried it. It has lots of fruit and style. Chateau Tronquoy-Lalande, from the team at Montrose, is full and nicely made and very much worth considering. Chateau Capbern Gasqueton, Calon-Segur’s other property, was a little sinewy but certainly has vigour and life. Chateau Le Crock looked neat and polished, a good effort I thought from the dedicated bunch at Chateau Léoville-Poyferré. I also caught up with Le Crock 2010 in bottle which looks good to me [I will update their profile shortly]. Although the usual advice is to steer clear of ‘second’ wines in tricky vintages, the very top estates are producing wines of cru classé quality, year in, year out. 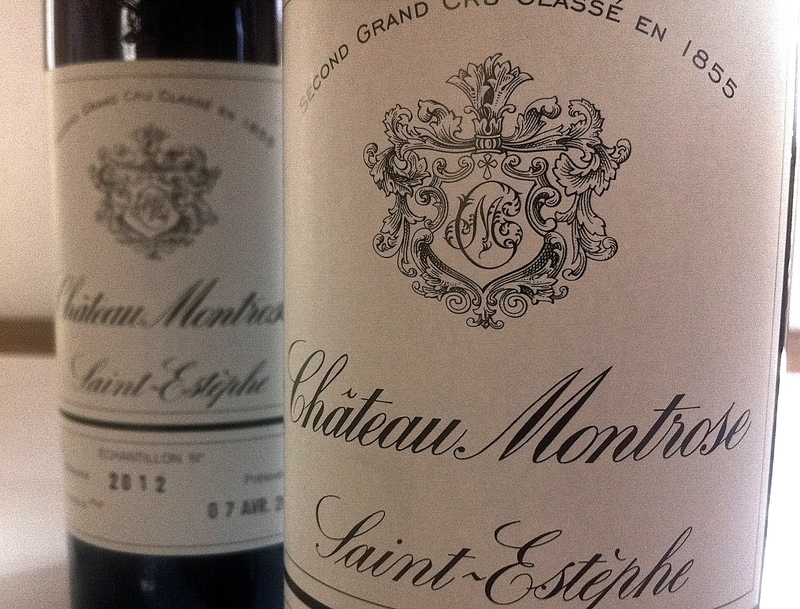 La Dame de Montrose, Les Pagodes de Cos and Marquis de Calon, in their different styles, are all reliable brands. All look good in 2012. I did manage a very brief look at several other St Estèphe’s at the Cru Bourgeois tasting at Chateau d’Agassac, but I’ve not included the notes here. I only got round to these at the end of a very heavy day’s tasting. I looked at Chateau Beausite, Chateau Le Boscq, Chateau Clauzet, Chateau La Commanderie and Chateau Lilian-Ladouys. Overall nothing sung to me at all. I hope to catch up with these wines again at Vinexpo and, with a fresher palate, I’ll post notes on these then. In the meantime here are the notes on seventeen St Estèphe tasted a various chateaux and at the Union des Grand Crus event at Chateau Phélan-Ségur. Hope they are helpful. As usual, notes more important than the numbers…. I have to say that overall I found Pauillac a bit tricky to assess in 2012. I’d really have liked to have recommended these wholeheartedly, but there was real variation in the two passes I made on these wines at the Union des Grands Crus events. Only a handful of wines were completely consistent on both occasions. I’ve already written on the first growths. For me Chateau Mouton-Rothschild leads the pack with Lafite and Latour behind, though in the overall qualitative list I’d put Chateau Pontet-Canet up in this group too. Chateau Grand-Puy-Lacoste also looked good as did Pichon-Comtesse de Lalande. Taken together these are my picks at the very top level. At the less expensive end Chateau Batailley and Haut-Batailley, the latter tasted at Chateau Grand-Puy-Lacoste, also looked liked good efforts, though quite different from each other. Chateau Haut-Bages-Libéral was also consistent, if typically leaner and more sappy in style. The rest? Well one sample of Lynch-Bages looked very good, the other disjointed. Likewise Pichon-Longueville was tad variable too. One sample looked very promising, another pretty tough and dry. These are barrel samples, of course, and they should all settle down but, from memory, things were more consistent here in 2011. I was also more impressed with Clerc-Milon and d’Armailhac when tasted at Mouton than I was at the UGCB, where I tasted them twice on different days. There the wines felt a little dumber and harder. This variability puts me in a bit of a quandary. 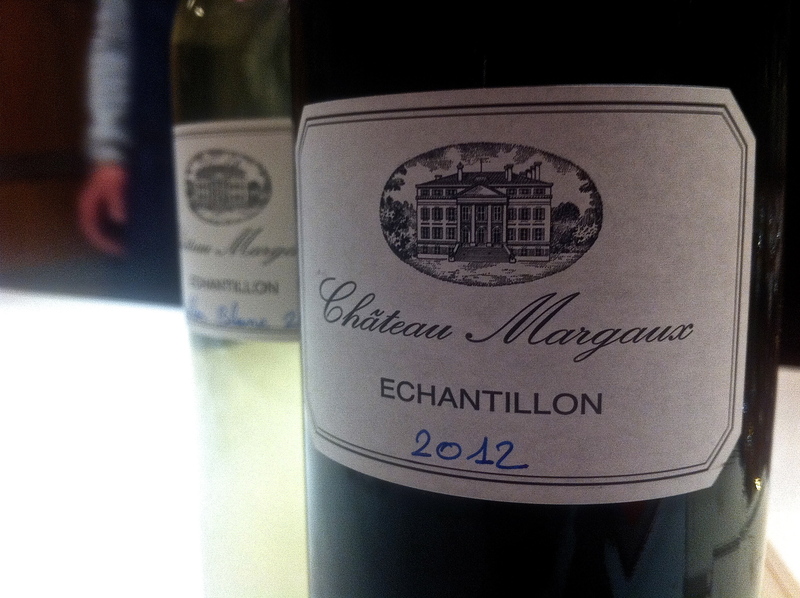 I found more consistency in St Julien and certainly in Margaux than in Pauillac in 2012. The Cabernet Sauvignon is sulky this vintage. There isn’t the ripeness of 2009 or 2010, or, dare I say it, even perhaps 2011 in a few cases. Personally I don’t see a huge qualitative difference between 2011 and 2012 in Pauillac at this stage, no matter what’s been said. You’d need to see these vintages side by side to be sure of course, but I suspect, that in time, we may perhaps even come to favour 2011 more in Pauillac than 2012. Certainly, save for a few properties [Mouton and Grand-Puy-Lacoste spring to mind] there is no real urgency to buy these wines en primeur on the basis of price or quality. This was also true of 2011. 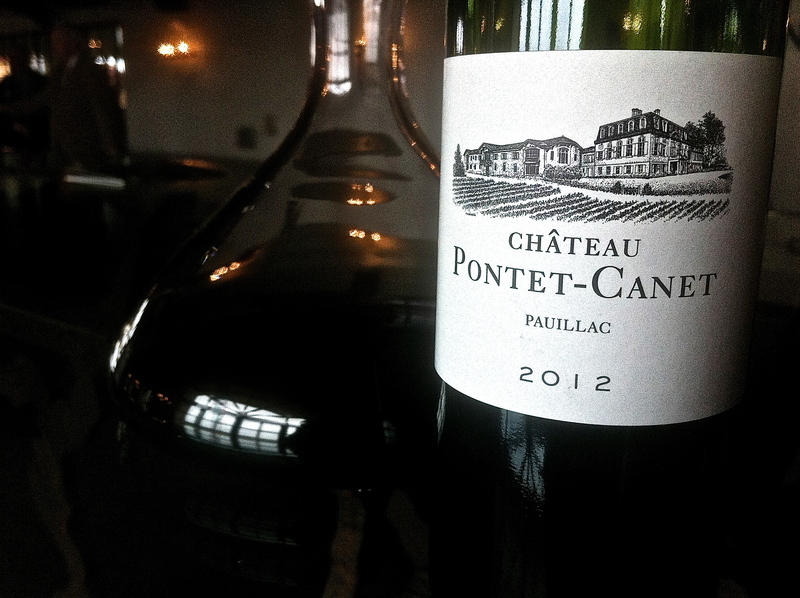 You may as well buy Pauillac that’s already bottled and of a similar quality from vintages like 2004, 2006 or 2008. They will work out cheaper and you can lay your hands on them already. My own vote would be to opt for a little bit more 2009 from those producers who are still under-the-radar, like Chateau Haut-Batailley and Chateau Grand-Puy Ducasse, or even Chateau Lynch-Moussas. I’d also consider others that are seriously top notch but that remain under-valued, such as Chateau Grand-Puy-Lacoste. I’d also consider Latour’s third wine, Pauillac de Latour, if you see it about. It’s not cheap but it is a beauty. And a little beauty is, I feel, what the vagaries of the weather have in many cases robbed us of in Pauillac in 2012. The following twenty-two wines are in alphabetical order. In some cases I’ve tasted the samples three times, in most cases twice. I’ve included both sets of notes and scores, though the notes are, as always, more important than the numbers! Good depth; healthy looking; nice elegant blackcurrant tones on the palate; glossy; elegance again on the palate; blackcurrant but a minerality and lean-ness on the mid-palate. Stalky blackcurrants. Nevertheless fine tannins and very good length. Will fill out. Tasted Thursday April 11, 2013. 89-91+ [Earlier note] Mid depth; fresh looking; good Cabernet fruit; stalky blackcurrants; layers; fresh and elegant; pure Cab on the palate; quite silky with elegance and balance; maybe lacks a bit of stuffing in the middle currently but should fill out. Nice length on the finish. 59% Cabernet Sauvignon, 28% Merlot, 8% Cabernet Franc, 5% Petit-Verdot. 13% alc. Tasted UGC Tuesday April 9, 2013. 90-92. I have to admit that I wasn’t exactly knocked over by the showing of the wines of St Julien in 2012 despite two detailed passes of the commune on separate days. Yes the best are correct enough and will make decent wine, but many don’t set the pulse racing, or offer the immediate charm of the best properties in the Margaux or Pessac-Léognan appellations or the potential of the even better wines on the right bank. Overall they feel a bit joyless, like the vintage rain has dampened their spirits. Unless they are released at prices less than available vintages now, few make sense as an en primeur purchase today. That’s not to say that if you are a die-hard St Julien fan that there aren’t wines to consider. The best wines are undoubtedly the Léovilles – Château Léoville-Las-Cases [and their excellent Clos du Marquis], Château Léoville Poyferré and Château Léoville Barton. 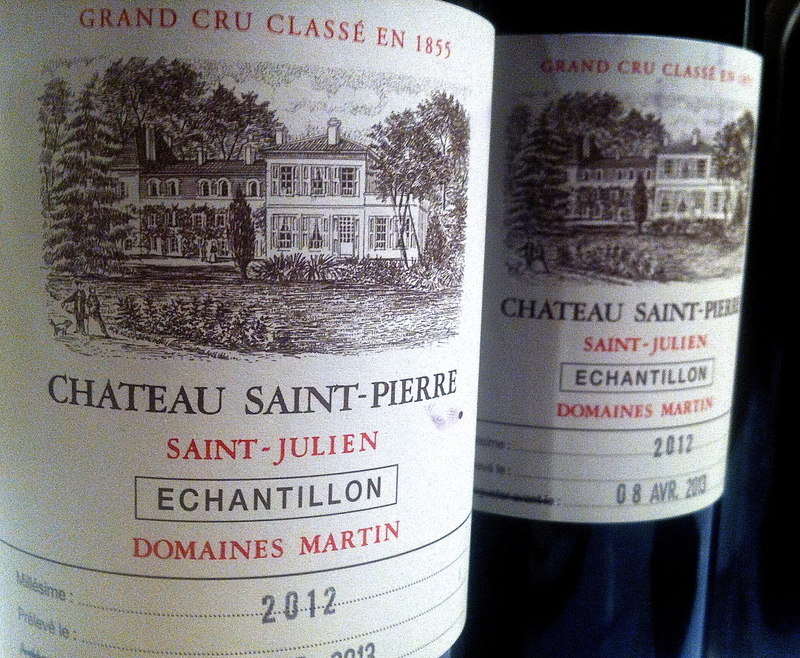 Château Saint-Pierre [photo above] also looked good in a fresh, blackcurrant style along with Château Langoa-Barton. I didn’t make it to Château Ducru Beaucaillou. Amongst the values Château Gloria had plenty of fruit and sap, but, again, it all depends on price. The rest? Château Gruaud-Larose looked pretty consistent, Château Branaire-Ducru a little lean and chewy to me but it’s usually a bit slow to come forward early on. There was inconsistency in the samples of Château Lagrange, one was extremely dry and tannic, and Château Talbot felt pretty grippy and angular. Château Beychevelle had a curiously jammy note yet then felt stretched in the mid-palate and dry on the end. All these wines should be better down the track, and that’s when we should be considering them too, certainly not as en primeur purchases, unless offered at a compelling discount to available vintages. At the time of writing few St Julien properties have released prices, save for Talbot coming in at around £300 a case. The message for the rest has to be come in at 10% or 20% less for the price your 2008s or 2006s are now trading at, to make a mark. Mid depth; little oak influence; some jam; red fruits; black cherry too; palate feels a bit hard; finishes dry. Should fill out further but feels a little mean on the finish. 2011 felt a little better to me. 85-87 UGC Tasted April 11, 2013 [Earlier note] Deep looking; red fruits, jammy note; strawberry tones; red fruits and feels a little worked; some tannin to resolve at the end, feels extracted and a little stretched. Will probably settle but feels a little hollow to me after the up-front jam lift. 47% Cabernet Sauvignon, 44% Merlot, 5% Petit Verdot, 4% Cabernet Franc. Harvested Cabernet between October 12-18, so relatively late. Tasted UGC April 9, 2013. 86-88. Deep-ish; fresh looking; some fresh, sappy Cabernet tones on the nose; quite taut palate; angular and grippy quality to the tannins; firm acid; chewy palate. Overall the wine has a certain density but also angularity and grip. Not a huge joy. 87-88 UGC Tasted April 11, 2013 [Earlier note] Mid depth; some stalky notes; fresh Cabernet; some spices; feels fairly high-toned and ‘boney’; angular palate [sample a little cold] feels a bit pinched. Tasted UGC Tuesday April 9, 2013. 86-88. Deep and dark at centre; fresh blackcurrants; clean; some spice; fresh and grippy palate but with chew and density; tannic and dry on the finish. Lots of extract and material so should come good. 87-89 Tasted UGC Thursday 11, 2013 [Earlier note – slightly better] Deep and saturated; looks enticing; lots of fresh blackcurrant fruit and spices; some cherry; lots of fruit evident on the nose; lots of fruit and purity; chew also. Chewy with plenty of extract. Should settle nicely. 63% Cabernet Sauvignon, 27% Merlot, 5% Cabernet Franc and 5% Petit Verdot Tasted UGC Tuesday April 9, 2013. 88-90. Deep and saturated looking; vibrant edge; very deep nose; enticing, focused and precise; layers; excellent depth of fruit on the nose. The palate is full of fruit, material and ripe tannin; there is a lot of stuff here but it is very focused indeed. There is a roundness and ripe quality which gives a balanced and harmonious feel to the palate. Excellent length and very nicely done. 74% Cabernet Sauvignon, 15% Merlot, 11% Cabernet Franc 80% new oak, 13.47 alc IPT 70 pH 3.6. 94-96+ Tasted at the Chateau Friday, April 12, 2013. Deep and saturated; minerality; blackcurrants; cassis and some blackcurrant lift; purity here; life and spice too; nice entry; cassis; blackcurrant; nice balance this is attractive and quite supple and round. 48% Cabernet Sauvignon, 44% Merlot, 8% Cabernet Franc 13.53 % alc 20% new barrels yield 33hl/ha IPT68. pH 3.59 89-91+Tasted at the Chateau Friday, April 12, 2013. Overall a surprisingly homogeneous and really encouraging set of wines that confirms, for me at least, that the Margaux commune probably out-performs St Estèphe, Pauillac and St Julien in 2012 in terms of consistency, delicacy and drinkability. Early maturing certainly but not in the under-ripe, hollow sense. There is genuine lushness in many of the wines, layers of ripe, velvety fruit provided by the beautiful Merlot that the vintage produced. It combines nicely with the tighter, admittedly fresher, but rarely angular or green Cabernet Sauvignon. The combination works well. Given the right pricing [critical] the best are seriously worth considering. Certainly they are a far better set of wines overall than in 2011. As usual the wines come in a range of styles. Some of these variations are terroir driven – Margaux is a very large appellation that covers a big patch of the southern Haut-Médoc – some of them are stylistic. At this stage in wines that are less then five months old you are looking for depth of fruit and purity. There are a number that provide this and look pretty exciting. As I’ve already said Merlot has succeeded very well here in 2012 but the Cabernet looks good enough and, in several cases, really impresses. Château Margaux, for instance, as produced an exciting wine based on 87% Cabernet Sauvignon. Their Pavillon Rouge is also impressive this year and largely Cab based. There is nearly 70% Cabernet Sauvignon in Château Brane-Cantenac’s delicious offering and in Château Giscours too which also looks very appealing. These properties all have exceptional terroir. Clearly this has come into play in 2012, and, together with diligent work in the vineyard, the Cabernet here seems almost unaffected by the October rain. They are elegant but seem perfectly ripe. Further north you go [St Julien, Pauillac & St Estèphe] you do get the impression of more stalky, grippy Cabernet Sauvignon [I also found this the case with some in Pessac-Léognan] but not so much here. The key ally, of course, is the Merlot here, but it does not feel like it is hiding or disguising un-ripe Cab. Many wines feel complete, front to back. That said the Merlot is beautiful here. Château Palmer and their excellent Alter Ego have a wonderfully lush and velvet quality because of it. These characteristics can also be found elsewhere. 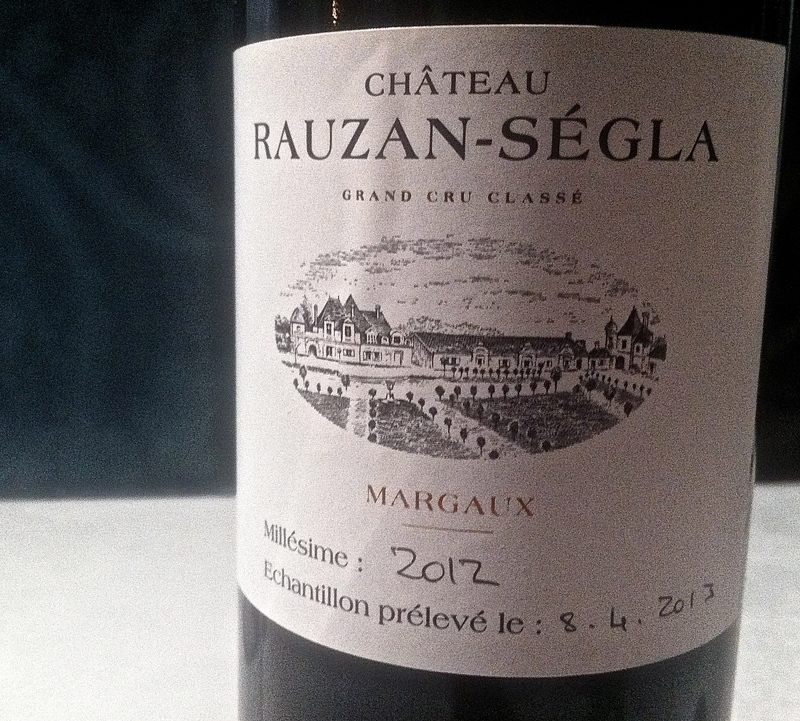 Château Rauzan-Ségla looks an excellent offering, serious as ever, but with layers or creamy fruit on offer which surely reflects the Merlot’s beauty. I’m also a fan of Château Angludet and Château du Tertre who make pure, elegant Margaux, unadorned with oak or fatigued by cellar hi-jinks. These also look good bets in 2012 for value and for relatively early drinking. Château Siran also impressed. There is more grip and sap here for sure but there is plenty of lush fruit and this should come together nicely. Likewise Château Prieuré-Lichine continues the evident improvement in recent years. There’s a lots of flavour here, lushness and the feel overall is far less chunky than usual. Greater delicacy for sure. I’ve enjoyed Château Labégorce a lot recently but felt there was a fraction too much oak masking this young wine and the tannins a fraction drying. Nevertheless the fruit is obviously good here and it should settle. Château Ferrière looks good in its tight, sappy way and there is more flesh on the bones than usual. It should prove good, lively Margaux. Château Kirwan also looks very good this year. There is more plushness and less extraction and the overall package feels fine and attractive. Château Lascombes and Château Malescot St-Exupéry are very similar in style, very reduced and sublimated, concentrated definitely, with lots of lush fruit, but fairly heavy use of oak. The oak is integrated but masks the purity of their fruit. There are those that would give these the higher marks but I’ve held back on these, very good though they obviously are. This style appeals less and less to me these days. Then there are those that are over-extracted and overworked. Château Marquis des Terme felt stretched and over-extracted with very drying tannins. Château Cantenac-Brown was inconsistent, one sample chewy and dry, the other a little green somewhere. Château Dauzac was also inconsistent. One sample had a vegetal note [parsnips!] and both felt chewy. The following wines were tasted by-and-large at the UGC Margaux tasting at Château Labégorce. I tasted the wines twice on two separate occasions. 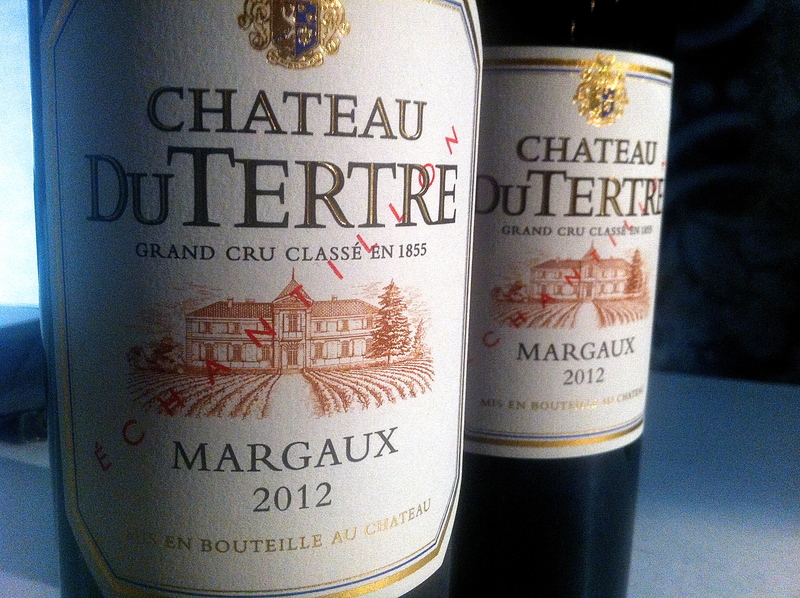 The other notes are from tastings at Château Margaux, Château Palmer and a few from elsewhere. I hope they are helpful. As ever the notes are more important than the numbers – banal perhaps but seemingly essential these days. Deep and saturated; very bright; tight to edge; lots of ripe fruit on the nose; pretty; almost some fatness; lush and layered; very sweet and ripe entry; lush fruit; nice tension on the finish; very polished but lots of pretty fruit. 51% Merlot, 40% Cabernet 9% PV 13.4 alcohol 91-93. Tasted at Chateau Palmer Thursday, April 11, 2013. Very deep and saturated; little more freshness and lift; fresh; ripe and pretty lush; elegance and freshness. 50% Merlot, 50% Cabernet Sauvignon 88-90. Tasted with JL Thunevin, Friday April 12, 2013. Very good colour; deep and saturated; dense to edge; violets, layers, very composed and excellent manners; lushness too; quite tight on the palate but obvious depth and layers; some earth, little undergrowth; structure beneath but very attractive overall; grip and chew on the end. Consistent notes. 92-93+ UGC Thursday April 11, 2013 [Earlier note] Deep and saturated colour; very fresh and elegant; vivacious on the nose; real delicacy here; very attractive; palate very flattering with real delicacy and lush flavours from what appears to be extremely attractive Merlot in the blend; very good wine with some grip at the end. Nicely done. 68% Cabernet Sauvignon, 32% Merlot. 92-93+ Tasted UGC Tuesday April 9, 2013. Deep and saturated colour; tight to the edge; chalky, mineral nose; wet rocks; some plushness; slightly green streak somewhere; a plusher and lusher sample than before; not as tannic as before but green streak. Inconsistent notes. 86-88? Tasted Thursday April 11, 2013. [Earlier note] Deep and very extracted looking; lots of oak [someone remarked it smells like a white wine]; quite sublimated in feel; very thick and extractive palate – wow – Merlot 60% new oak – loads of tannin; feels very recipe wine making for me. Very dry and astringent on the finish. May settle but will always be chunky and lacking finesse. 65% Cabernet Sauvignon, 35% Merlot. 86-88. Tasted UGC Tuesday April 9, 2013. Deep and saturated colour; tight to edge; quite lifted; slight parsnip note again; oak, apparent depth; palate a little less vegetal than earlier; lots of plush fruit and ripe Merlot; not too extracted but a chewy finish. 87-88 Tasted UGC Thursday April 11, 2013 [Earlier note] Deep and saturated colour; vegetal nose; parsnips, earthy notes and equally lush in some ways [on the nose] very soft and easy palate; lush and lashings of oak and saturated flavours; not that bad in a thick, melded way but not sure about the vegetal note. Chewy finish. 37% Merlot, 63% Cabernet Sauvignon, 70% new oak 13% alc 85-87 Tasted UGC Tuesday April 9, 2013. Deep and dense; lively at edge; spicy, attractive nose; fruit cake and spicy plum, little undercurrent of earth; earthy entry; modest palate already quite forward and enjoyable; soft and early maturing style. Overall attractive. 87-88+ Tasted UGC Thursday April 11, 2013 [Earlier note] Deep and saturated; tight to the edge; some spice, oak and coffee bean; lifted and quite integrated; some perfume; easy entry, attractive mid palate; lacks a bit of tension on the finish. Also maybe a little too much oak? Not bad though. 54% Merlot and 46% Cabernet Sauvignon 12.2 degrees Alc 86-88 Tasted Tuesday, April 9, 2013. Deep and healthy looking; vibrant edge; fresh, stalky Cabernet; some black cherry [Angludet-like]; layers beneath; fresh Cab on the palate but with some weight behind; works very well; elegant yet more-ish. Very nicely handled and balanced. 90-91+ Tasted UGC Thursday April 11, 2013 [Earlier note] Mid depth, vibrant edge; very cool and fresh; with delicacy, perfume and life; very balanced palate and nicely harmonious. Very good effort and classical Margaux. 55% Cabernet Sauvignon, 27% Merlot, 11% Cabernet Franc and 7% Petit Verdot. 90-91+ Tasted UGC Tuesday April 9, 2013. Deep and saturated look; glossy; elegant and fresh notes; Cabernet feels ripe; some layers [oak at the back]; perfume; some black fruits; grip and structure; density with lots of material; chewy finish. Better sample than before. Tighter styled Margaux but pent up and should open nicely. 89-91+ UGC Thursday April 11, 2013 [Earlier note] Saturated and deep; some lift; quite fragrant and elegant if tight on the palate [as ever] but there is attractive fragrance and enough fruit. 68% Cabernet Sauvignon, 30% Merlot and 2% Cabernet Franc. 87-89 UGC Tuesday April, 9, 2013. Deep and dense; lifted nose; some perfume; oak; layered and attractive; lots of fruit here; some violet lift too; nice palate; good balance; lush quality; little drying from the oak [40% new]. Chewy finish. 87-89 Tasted UGC Thursday April 11, 2013. [Earlier note] Deep and saturated; smoky, lush and very forward; some violet notes; cassis, plums; nice palate with lots of lush fruit but nicely done; elegance to a degree; plenty of extract and material but ripe and supple. Very good effort and length too. 53% Merlot, 36% Cabernet Sauvignon, 8% Cabernet Franc and 3% Petit Verdot. 88-90 Tasted UGC Tuesday April 9, 2013. Deep and saturated; very worked and lifted nose; sublimated style with coffee and mocha notes [oak]; yet [somehow] purity of fruit beneath; violets; palate very lush, plenty of fruit; loads of it in fact; nice texture if in a sublimated, worked style. Lacks a bit of acid? Chewy finish. If they stepped back from the oak and let the fruit express itself this would be so much better for me. 90-91. Tasted UGC Thursday April 11, 2013. [Earlier note] Deep and saturated colour; lots of density but very lush indeed; deep; coffee bean notes from toasty oak; very lush palate, saturated palate but tannins are very fine and it doesn’t come across as over-extracted. Violets too. Chewy finish but good length. 80% new oak, 48% Merlot, 48% Cabernet Sauvignon, 4% Petit Verdot 13.3 degrees alc 90-92+ Tasted UGC Tuesday April 9, 2013. Deep and saturated; very lush; a boat load of ripe, lush fruit; saturated nose with sublimated fruit tones; violets, black cherry; more purity here; lots of lush fruit on the palate; some stalky cab too; lovely fruit here. Big and with a chewy finish. Overall more impressive than before. 91-93+ Tasted UGC April 11, 2013. [Earlier note] Deep and saturated; violets, cassis and coffee; very, very lush and sublimated style; lots of oak on the palate but lots of lush fruit. Feels like it fades a tad on the palate and lacks grip? 56% Cabernet Sauvignon, 29% Merlot, 7% Cabernet Franc 13.2 degrees. 89-91? Tasted UGC Tuesday April 9, 2013. Mid depth; healthy looking; perfume; cassis and blackcurrant from the Cabernet; layers and perfume here; violets and depth; layered and tight yet ripe on the palate; density but not dry tannin; very precise and focused with structure; very fine tannins; very nice length; very good purity overall and far, far better than 2011 here; 100% new oak but not at all noticeable. Very good length indeed. 87% Cabernet Sauvignon 10% Merlot, 2% Cabernet Franc. 95-96+ Tasted at the chateau Thursday April 11, 2013. Big and deep looking in the glass; saturated to the meniscus; lots of depth and perfume; feels very polished; very deep and concentrated style of Margaux; lots of fruit and very extracted; slightly woody note but will settle. Big certainly but maybe not quite as refined as the very best Margaux in 2012. See how it settles. 89-91. 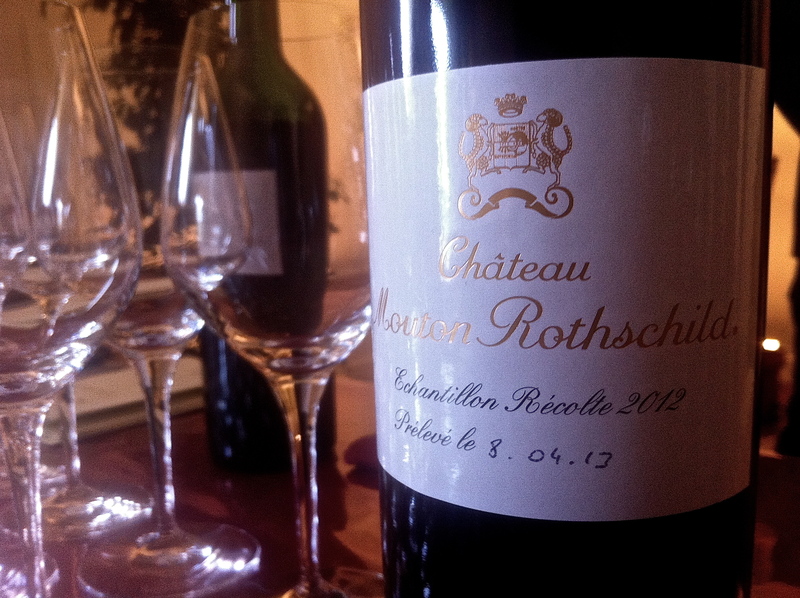 Tasted at JL Thunevin, Friday April, 12, 2013. Deep and saturated; red fruits – strawberry, redcurrant; bit jammy; sweet ripe entry on the palate and then drying palate; tannic; feels stretched and over-extracted to me. Lacks freshness and feels stretched. 86-88? Tasted UGC Thursday April 11, 2013. [Earlier note] Deep and saturated; quite melded, lush and lifted; red fruits and jam; worked; lots of oak on the palate; chewy red fruits and oak; forward and pushed tannins at the back. Oak tannin on the end too. Too forced and worked relative to the fruit. 55% Cabernet Sauvignon, 40% Merlot, 5% Petit Verdot. 87-88? Tasted UGC April 9, 2013. Deep colour; some fresh Cabernet fruit; spices; palate spicy, less lush than many; feels more angular and tannic. Dry on the finish. Not a success for Monbrison on the basis of this sample. Inconsistent notes. 85-86? UGC April 11, 2013 [Earlier note] Deep, vibrant edge; legs; some pure fruit, some violet perfume; nice layers here; fat Merlot; vibrant palate with some acid and maybe a little angularity from the Cabernet coming through, 69% Cabernet Sauvignon, 28% Merlot and 3% Petot Verdot. 13 degrees. 87-88 Tasted UGC April 9, 2013. Deep and saturated; colour right up to rim; lots of saturated fruit with a little oak present at the edge; very deep; focused and precise; very plush too; lots of saturation on the palate; voluptuous and yet also a lot of density and layers to this; very nice length and excellent concentration for the vintage. Will be a beauty early on. 13.5 degrees alc, 48% Merlot, 46% Cabernet Sauvignon, 6% Petit Verdot. 94-96. Tasted at the chateau Thursday, April 11, 2013. Deep saturated colour; glossy; pretty nose; very attractive fruit tones; some spice, some polish and minerality; nice layers to the nose; little cherry too; sweet entry on the palate; round and nicely balanced; creamy notes; nice bite and balance. Very good effort. Quite structured and tannins very mannered and precise. 63% Cabernet Sauvignon, 32% Merlot, 3% Petit Verdot 1% Cabernet Franc. 91-93+ Tasted at the chateau Thursday, April 11, 2013. Deep and saturated; purple at edge; looks fresh and vibrant; elegant, delicacy on the nose; layers of fruit and nice blackcurrant tones alongside plums; attractive entry; material and density with plenty of fruit; flesh here; little grippy on the finish but a good effort. 88-90+ Tasted UGC April 11, 2013 [Earlier note] Deep and saturated; nicely layered nose; plush fruit here; some spice and a very enticing combination; very flattering palate, ripe, easy and perfumed; nicely done. Very flattering and good length. Chocolate and mocha on the finish. 65% Cabernet Sauvignon, 30% Merlot, 5% Petit Verdot 13 degrees. 89-91+ Tasted UGC Tuesday April 9, 2013. Deep and saturated; tight to the rim; creamy, layered nose; lushness here; seam of fruit; blackcurrants; nice palate with very good entry; focused and precise; some tannin at the end but very much in keeping with the fruit and structure of the wine. Serious but plenty of material. Very impressive. 92-94+ Tasted UGC Thursday April 11, 2013 [Earlier note] Deep and saturated looking; some spices, ripe fruits and layers; nice seam of fruit; nice entry, full, lush and layered with extract and material. A supple quality here too [usually a little stern and correct]. Well balanced and harmonious. 54.5% Cabernet Sauvignon, 44% Merlot and 1.5% Petit Verdot. 13 degrees 92-94+ Tasted UGC Tuesday April 9, 2013. Healthy looking; vibrant; violets, some perfume; some chalk; refined entry; cooler and fresher fruit; bit grippy and sappy but should come good; nice freshness and spice to the palate. Good length. Vigorous Margaux. 87-89. Tasted UGC Thursday April 11, 2013. [Earlier note] Mid depth; ripe, attractive fruit with perfume and a certain elegance; very good palate – ripe and lush; very attractive; some grip too but overall a very attractive and forward style. Very good supple and attractive offering from Siran. Good length and will be great value. 55% Merlot, 35% Cabernet Sauvignon, 10% Petit Verdot 13.4 degrees. 88-90. Tasted UGC Tuesday April 9, 2013.